Dogtown is the end product of a three-week design research investigation on users, needs, and existing Skymall products. It’s a service founded on the belief that everyone loves dogs, but that dogs are a lot of work and a great responsibility. Dogtown takes some of the stress off dog owners by connecting dog lovers to dogs. When a dog owner gets stuck at work or has to travel across the country, for example, s/he can find dog lovers to help out. 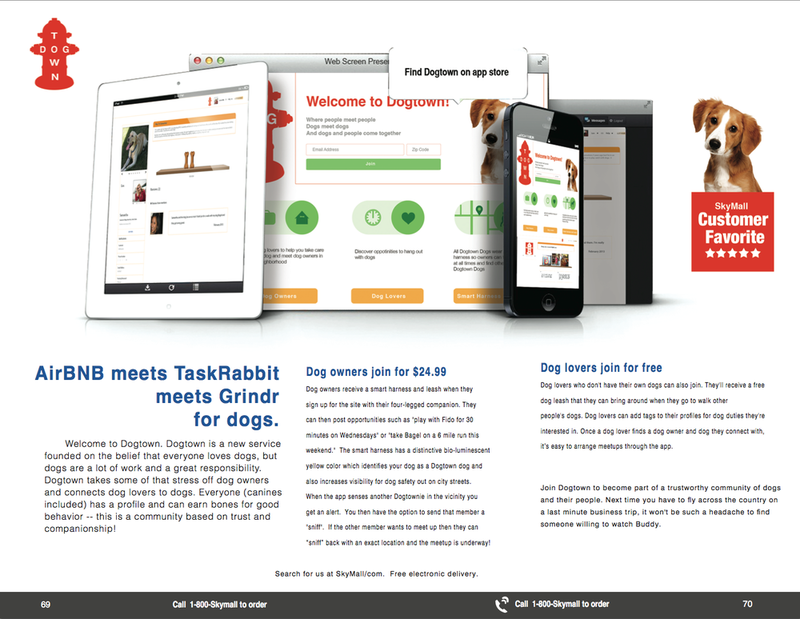 It’s AirBNB meets TaskRabbit meets Grindr for dogs. With this service, dog owners can get their dogs walked for free, and non-owners can get the benefits and joy of hanging out with dogs without the full-time responsibility and expense. Both types of members reap social benefits through the community, engendered by the website and app. Owners pay $24.99 to sign up for the service and receive a geo-locating harness that provides both security and peace of mind for the owner, while also generating opportunities for meet ups with other dog members and their walkers. Dog lovers can join for free. Everyone (canines included) has a profile, and earns "bones" for good behavior. Dogtown is a community based on trust and companionship. Initially, Hamilton, Plevin, and Sun set out to redesign the Pooch Potty Premium with Scented Hydrant—an artificial patch of grass that allows dogs to go to the bathroom indoors or on terraces when walking is inconvenient or impossible. The design research process started with determining use cases, creating a user profile, and interviewing dog owners. Upon synthesizing observations, however, a few key insights surfaced up: 1) Dogs are a social lubricant and a way to meet people in an otherwise lonely world; 2) Dogs bring their owners a lot of joy; and 3) Dogs are a lot of work. The generative insights led to design opportunities: How might we connect dog owners through their dogs? How might we help non-dog owners experience the joy of owning a dog? And how might we connect dog owners who need help, with non-dog owners who want to help? Framed this way, Dogtown became a novel solution that serves all stakeholders.